Investment is up, but Goodbody stockbrokers say that now is not the time to ease off on austerity. THE GROWTH IN the jobs market is a major positive for the Irish economy, but now is not the time to cut back on austerity, a new report says. In its latest economic outlook, entitled “A Jobs Friendly Recovery”, Goodbody says investment continues to be the key driver of the recovery of the economy, citing a growth of 25% in investment in the last three months of last year. However, Dermot O’Leary, who is the chief economist with Goodbody says that now is not the time to start looking beyond austerity. “Although the recovery in the Irish economy is gaining strength, we are cautioning against the temptation to ease back on austerity in Budget 2015. “Stronger domestic momentum means that budget deficit targets look readily achievable but it would be wrong to suggest that the job is done. The stockbroker’s GDP forecasts are left largely unchanged for both 2014 (2.6%) and 2015 (3.1%), but within that Goodbody expects domestic demand to grow by 2.5% this year and 2.7% next year. However, Goodbody says that GDP and GNP are “increasingly irrelevant” because of the pharmaceutical patent cliff. Email “Now is not the time to ease off on austerity, says new report”. 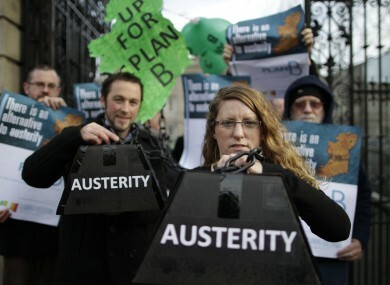 Feedback on “Now is not the time to ease off on austerity, says new report”.